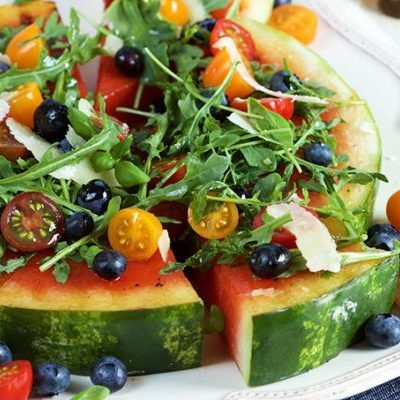 Try making this Liquored Up Watermelon Fruit Bowl for your next crazy summer party! Watch the video showing you how to make this recipe, then scroll to the bottom of this post and print out the recipe so you can make it at home! 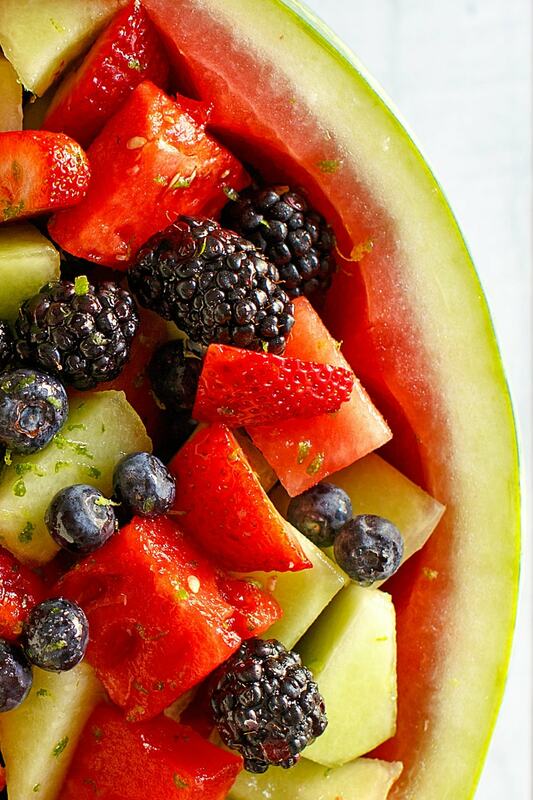 A watermelon fruit bowl is so darn pretty to serve at a party. You can fill it with all kinds of colorful fruit. It displays well and look gorgeous on your serving table. This version turns your watermelon fruit bowl into an adults- only fruit salad. Chop up whatever fruit you’d like for this recipe. 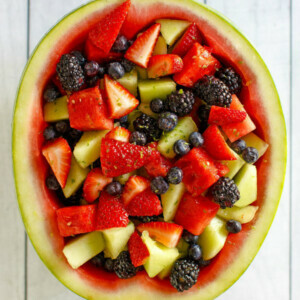 I recommend watermelon (of course), honeydew melon, strawberries, blueberries and blackberries. 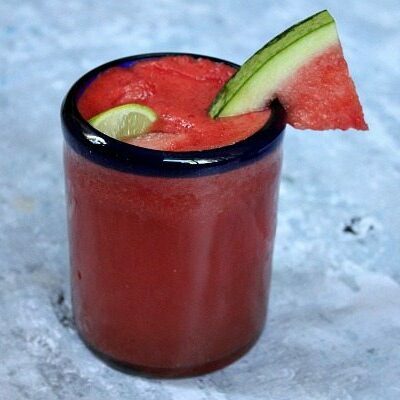 You’ll be drizzling a boozy syrup over the top to create a Liquored Up Watermelon Fruit Bowl! The most important step in making a watermelon fruit bowl is making the bowl itself out of an actual watermelon. Buy a seedless watermelon from the store. Cut it in half either lengthwise or crosswise (depending on what shape you’d like your bowl to be). You’ll notice that the (round) watermelon half might be a little wobbly when you try to set it on your work surface. There’s a solution for that! Just cut a thin slice on the bottom of the watermelon to create a flat area on which the watermelon can sit. Then you’ll take a knife and gently cut around the edge of the watermelon half- near the rind. Then take a knife or a flat ice cream scoop or large spoon to cut out chunks of the watermelon until you have created a nice bowl inside the watermelon half. 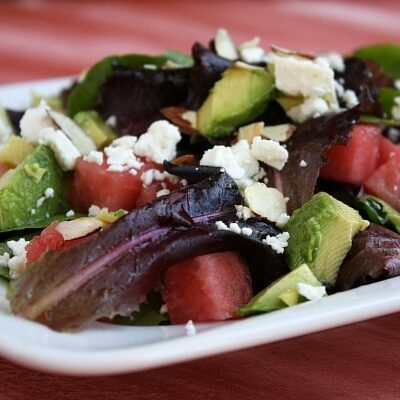 You can then cut the watermelon into chunks to use in the salad. Repeat with the other half if you’d like to make two bowls! 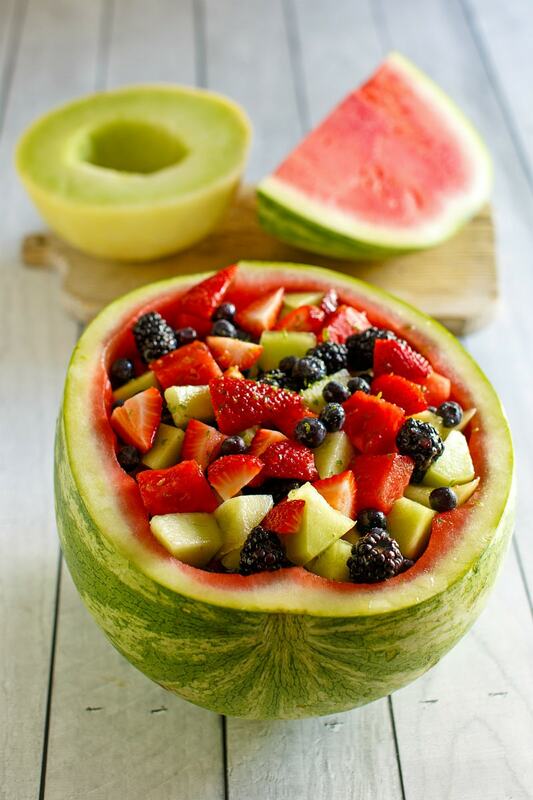 Add the fruit to the bowl. At this point, you have three choices for how to serve this. Serve it as a fruit bowl just the way it is (without any alcohol), make a lime simple syrup and drizzle that on top, or make the liquored up simple syrup and drizzle that on top. If you’re making the liquored up version, be sure to serve it at an adults-only party… or keep it safe out of reach of the little ones who like their fruit. 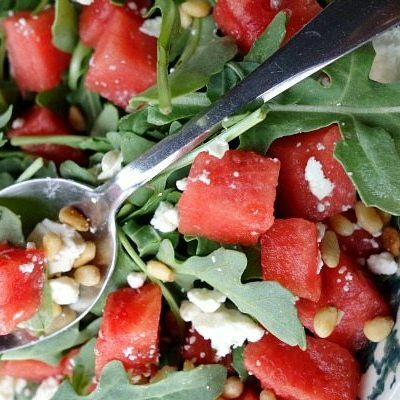 It’s a fun summer dish to serve, but it’s definitely not for the kids! If you’re looking for more salad recipes that are fun to serve in the summer, try my Grilled Corn Salad, Triple Berry Salad with Sugared Almonds or this Summer Wild Rice Salad. Old Fashioned Macaroni Salad and Tzatziki Salad are good choices too! This summer fruit is soaked in rum, vodka, and a lime simple syrup. 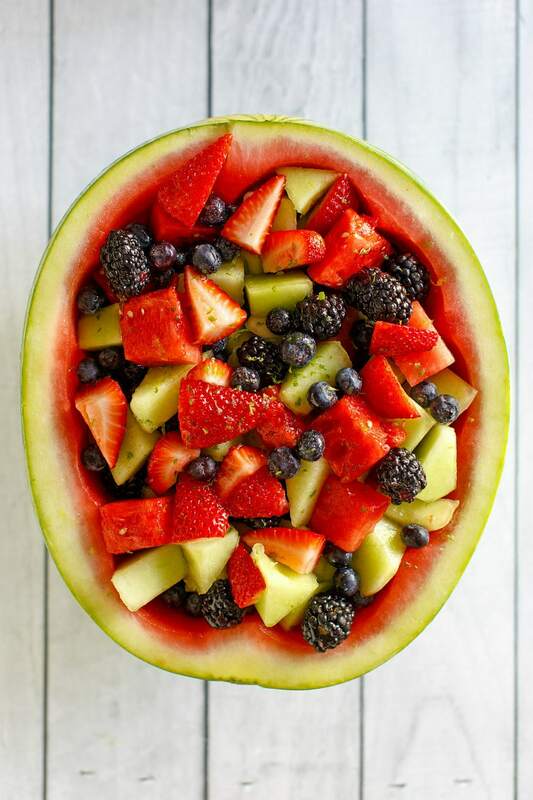 Served in a watermelon bowl! Boil sugar and water together until sugar dissolves. Remove from heat and let cool for a bit. Add the vodka, rum, lime juice and lime zest and stir to combine. Cool. 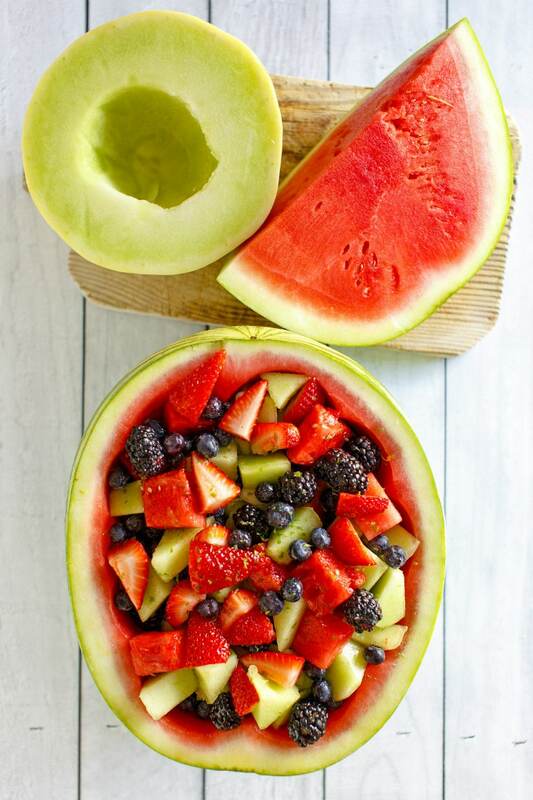 Scoop out round balls of cantaloupe, honeydew and seedless watermelon (or cut into chunks). Place inside a hollowed out watermelon or watermelon basket. Add strawberries and blueberries. Pour liquid over fruit and serve. Or let marinate for a bit and then serve. *Time saver: Prepare the syrup ahead of time and let it chill until you're ready to mix it with the fruit. *To hollow out a watermelon, cut it in half. Cut a small, thin slice on the bottom of the half so it will sit sturdy on a flat surface. Use a knife to cut around the outside edge of the watermelon (near the rind). Then use a knife or an ice cream spatula to cut out chunks of the watermelon until you have a nice deep bowl to put the fruit in.